Homemade Pasta | Let's Eat! 4 Cups of flour (I like to use half semolina, half “Antimo Caputo 00”, but all-purpose will do just fine). 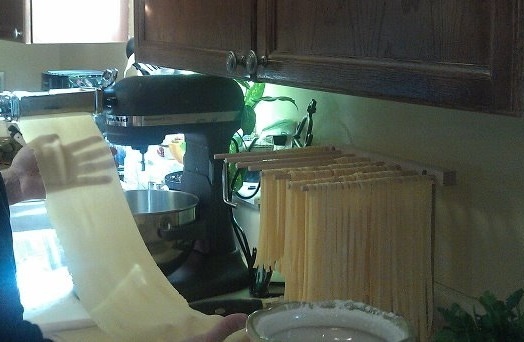 There are probably a thousand different ways to make pasta. As with pizza, they are all great, but some are better than others! If you make it fresh and cook it right it is hard to tell the difference between one recipe or the other. Any recipe you use will get better the more you do it because you will learn what you are “looking for”, as my grandmother used to say. The dough should end up soft but not sticky or wet. If the dough is too dry it will not roll out easily. Homemade pasta dough can be used for many types of pasta and prepared in a countless number of dishes. This basic recipe can be made into cut pasta, such as linguine, spaghetti rolled out into ravioli or even lasagna noodles. Sift the flour into a large bowl (if you don’t have a sifter it’s fine, this just adds a little softer consistency). Make a well in the center of the flour and add 6 eggs, 2 tablespoons olive oil and 1 tablespoon of water to the well and whisk gently with a fork gradually incorporating the flour from the side of the well. (Some people do this without a bowl by making a mound of flour on a dough board with a well and mixing the eggs and flour without the assistance of a bowl. I’ve done this and sometimes it works out and sometimes it makes a total mess so I stopped trying to impress myself and always use a bowl!). When the mixture becomes too thick to mix with a fork, remove the dough from the bowl and place on a smooth surface and knead it by hand for 8-10 minutes. If the dough is wet, add a small dust of flour at a time. It’s important not to over flour. You’re looking for a smooth consistency. You want to be just beyond sticky. When your dough is smooth, form it into a ball and wrap it with plastic and allow it to rest at room temperature for 30 minutes. After 30 minutes the fun begins!! Cut the dough ball into quarters and flatten each quarter by hand to about half-inch think. Roll out the dough with a pasta machine or rolling-pin to the desired thickness and then cut the sheets into your favorite style of pasta noodle or ravioli! As you can see by the picture below, I use a Kitchenaid mixer with pasta attachments. You first roll the sheets, then change the attachment to the pasta cutter and cut the sheets to the size you like. The sheet I’m rolling is for ravioli so you can see I’ve rolled it to a very thin sheet and you can see my hand through it. This makes amazing ravioli! The pasta should cook in boiling water for about 4-6 minutes. Once the fresh pasta floats to the top it should be done. Taste a piece to see if it’s to your preference. Humor me with a short story about how amazingly versatile this recipe can be and how much fun you can have with it!! Then things got very interesting. Peggy is an incredibly talented home chef and she can do things most home chefs won’t even try. I was joking with her about a dish I saw on the show Top Chef that used a whole egg yolk inside a ravioli. Her eyes lit up and she said, “roll me out a sheet for ravioli and let’s do it!”. I figured this would just end in disaster, but it sounded like it might be fun so I rolled her a sheet of pasta dough and amazingly look what she did!! 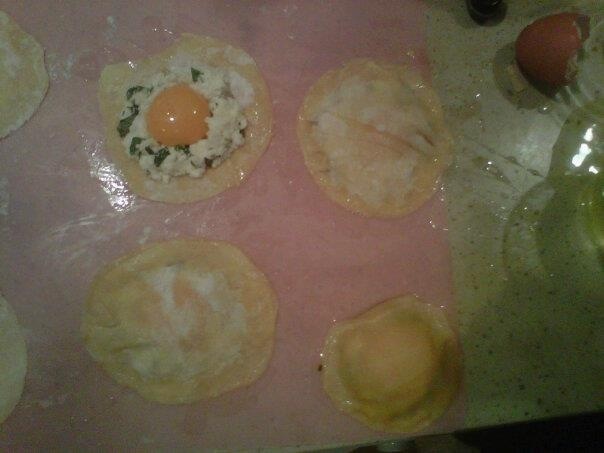 She took some feta or goat cheese (I can’t recall which one), made a little nest for the egg yolk and cracked it in the center and then covered it with another piece of dough to make this amazing ravioli! She threw on a pan of water and brought it to a simmer and gently placed the ravioli into the pan and simmered it for about 7 minutes. This was one of the best things I’ve ever eaten. When you cut into the ravioli it makes a sauce that reminded me of carbonara! This was an amazing weekend with fantastic food experiences, including a blue crab boil!! But that’s probably for another posting because it comes with its own incredible Short, Hillarious, And, Really Terrific stories!!! 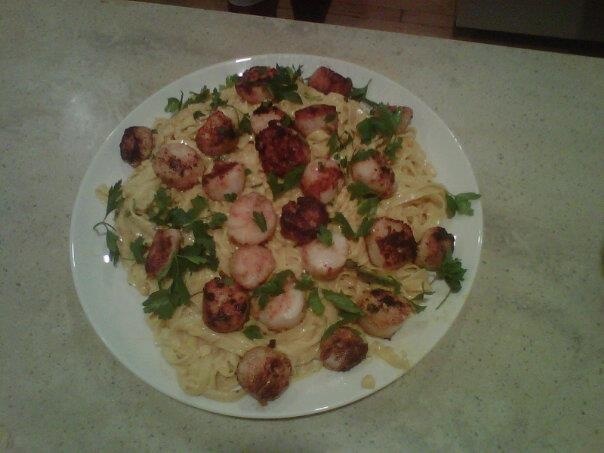 This entry was posted in Recipes and tagged Pasta, Pasta Dough, Ravioli. Bookmark the permalink. Pingback: Chicken Fettuccine Alfredo | Let's Eat!